Define the vapour pressure of liquids. All liquids have a certain portion of their particles having enough energy to enter the gas phase, and if these particles are at the surface of the liquid, they do so (Figure 10.6 “Evapouration”). The formation of a gas from a liquid at temperatures below the boiling point is called evapouration. At these temperatures, the material in the gas phase is called vapour, rather than gas; the term gas is reserved for when the gas phase is the stable phase. Some particles of a liquid have enough energy to escape the liquid phase to become a vapour. If the available volume is large enough, eventually all the liquid will become vapour. But if the available volume is not enough, eventually some of the vapour particles will reenter the liquid phase (Figure 10.7 “Equilibrium”). At some point, the number of particles entering the vapour phase will equal the number of particles leaving the vapour phase, so there is no net change in the amount of vapour in the system. We say that the system is at equilibrium. The partial pressure of the vapour at equilibrium is called the vapour pressure of the liquid. At some point, the number of particles entering the vapour phase will be balanced by the number of particles returning to the liquid. This point is called equilibrium. Understand that the liquid has not stopped evapourating. The reverse process—condensation—is occurring as fast as evapouration is, so there is no net change in the amount of vapour in the system. The term dynamic equilibrium represents a situation in which a process still occurs, but the opposite process also occurs at the same rate so that there is no net change in the system. The vapour pressure for a substance is dependent on the temperature of the substance; as the temperature increases, so does the vapour pressure. Figure 10.8 “Plots of Vapor Pressure versus Temperature for Several Liquids” is a plot of vapour pressure versus temperature for several liquids. Having defined vapour pressure, we can also redefine the boiling point of a liquid: the temperature at which the vapour pressure of a liquid equals the surrounding environmental pressure. The normal vapour pressure, then, is the temperature at which the vapour pressure is 760 torr, or exactly 1 atm. Thus boiling points vary with surrounding pressure, a fact that can have large implications on cooking foods at lower- or higher-than-normal elevations. Atmospheric pressure varies significantly with altitude. The vapour pressure of a liquid depends on the identity of the liquid and the temperature, as this plot shows. Use Figure 10.8 “Plots of Vapor Pressure versus Temperature for Several Liquids” to estimate the boiling point of water at 500 torr, which is the approximate atmospheric pressure at the top of Mount Everest. See the accompanying figure. Five hundred torr is between 400 and 600, so we extend a line from that point on the y-axis across to the curve for water and then drop it down to the x-axis to read the associated temperature. It looks like the point on the water vapour pressure curve corresponds to a temperature of about 90°C, so we conclude that the boiling point of water at 500 torr is 90°C. 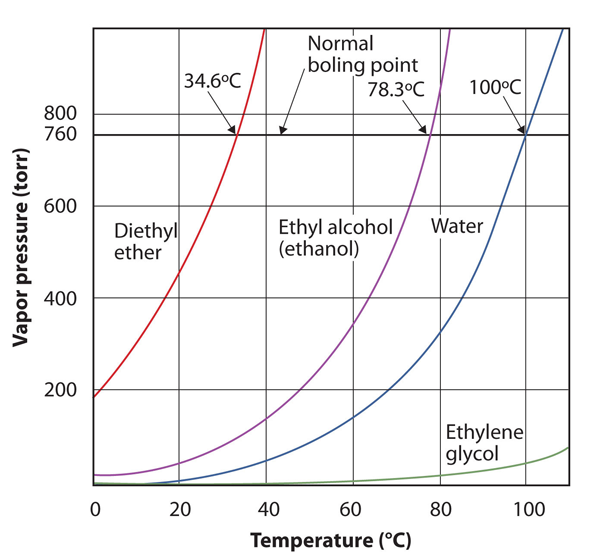 Use Figure 10.8 “Plots of Vapor Pressure versus Temperature for Several Liquids” to estimate the boiling point of ethanol at 400 torr. The vapour pressure curve for water is not exactly zero at the melting point—0°C. Even ice has a vapour pressure; that is why it sublimes over time. However, the vapour pressures of solids are typically much lower than that of liquids. At −1°C, the vapour pressure of ice is 4.2 torr. At a freezer temperature of 0°F (−17°C), the vapour pressure of ice is only 1.0 torr; so-called deep freezers can get down to −23°C, where the vapour pressure of ice is only 0.6 torr. A phase diagram is a graphical representation of the equilibrium relationships that exist between the phases of a substance under specified pressures and temperatures (Figure 10.10). The phase diagram is a combination of three curves: the vapour pressure curve, the melting curve and the sublimation curve. 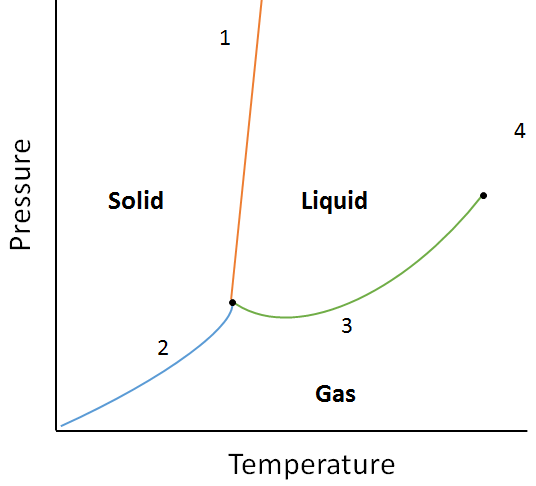 We have previously seen that vapour pressure curves represent the equilibrium between the liquid and gas phase, and the point at which the pressure equals 1 atm is the normal boiling point. One additional feature of this curve in the phase diagram (green), is that it ends at the critical point. The critical point is the point at the highest temperature and pressure at which liquids and gases remain distinguishable. 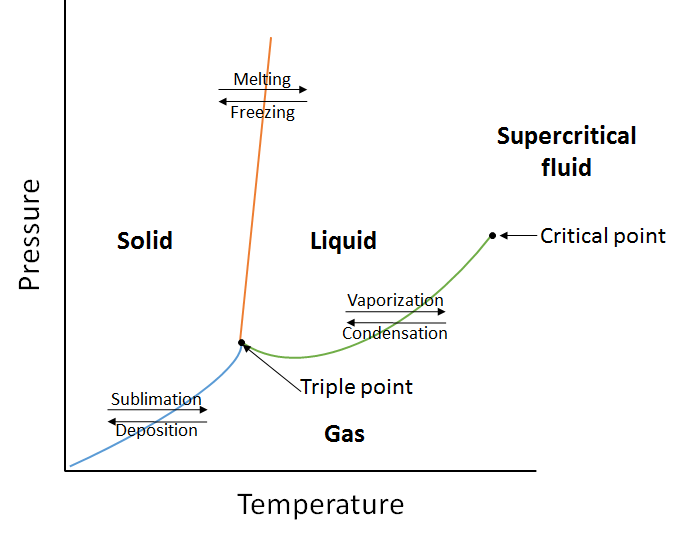 At temperatures and pressure beyond this point the matter exists in a phase with properties of both liquids and gases known as a supercritical fluid. The melting curve (orange) represents the equilibrium between solid and liquid, and the point at which the pressure equals 1 atm is the normal melting point. The sublimation curve (blue) represents the equilibrium which exists between solid and gas. Finally, the point where all three curves meet is known as the triple point. At this point, three phases (solid, liquid and gas) all exist at equilibrium. Figure 10.10. A generic phase diagram. a. The temperature is increased for matter at point 1.
b. The pressure is increased for matter at point 3.
a. Matter at point 1 will melt (change phase from solid to liquid) if the temperature is increased. b. Matter at point 3 will condense (change phase from gas to liquid) if the temperature is increased. All liquids share some other properties as well. Surface tension is an effect caused by an imbalance of forces on the atoms at the surface of a liquid, as shown in Figure 10.11 “Surface Tension”. The blue particle in the bulk of the liquid experiences intermolecular forces from all around, as illustrated by the arrows. However, the yellow particle on the surface does not experience any forces above it because there are no particles above it. This leads to an imbalance of forces that we call surface tension. Surface tension comes from the fact that particles at the surface of a liquid do not experience interactions from all directions, leading to an imbalance of forces on the surface. Water on the surface of this apple beads up due to the effect of surface tension. 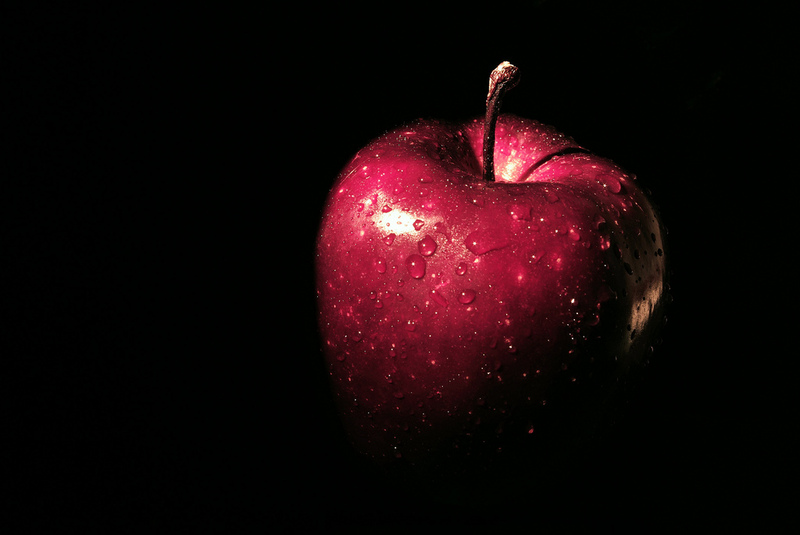 Source: “wet apple” by cristian ruberti is licensed under the Creative Commons Attribution-NonCommercial-ShareAlike 2.0 Generic. Surface tension is responsible for several well-known behaviours of liquids, including water. Liquids with high surface tension tend to bead up when present in small amounts (Figure 10.12 “Effects of Surface Tension”). Surface tension causes liquids to form spheres in free fall or zero gravity (see Figure 10.3 “Liquids and Gravity”: the “floating” water isn’t in the shape of a sphere by accident; it is the result of surface tension). 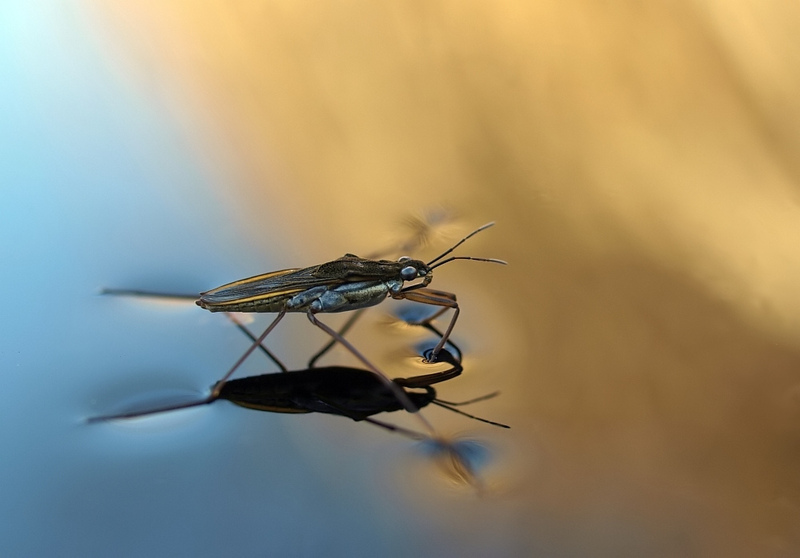 Surface tension is also responsible for the fact that small insects can “walk” on water. Because of surface tension, it takes energy to break the surface of a liquid, and if an object (such as an insect) is light enough, there is not enough force due to gravity for the object to break through the surface, so the object stays on top of the water (Figure 10.13 “Walking on Water”). Carefully done, this phenomenon can also be illustrated with a thin razor blade or a paper clip. Small insects can actually walk on top of water because of surface tension effects. Source: “Water Slider” by Orest Shvadchak is licensed under the Creative Commons Attribution-ShareAlike 2.0 Generic. Adhesion and cohesion are important for other phenomena as well. In particular, if adhesive forces are strong, then when a liquid is introduced to a small-diameter tube of another substance, the liquid moves up or down in the tube, as if ignoring gravity. Because tiny tubes are called capillaries, this phenomenon is called capillary action. For example, one type of capillary action—capillary rise—is seen when water or water-based liquids rise up in thin glass tubes (like the capillaries sometimes used in blood tests), forming an upwardly curved surface called a meniscus. Capillary action is also responsible for the “wicking” effect that towels and sponges use to dry wet objects; the matting of fibres forms tiny capillaries that have good adhesion with water. Cotton is a good material for this; polyester and other synthetic fabrics do not display similar capillary action, which is why you seldom find rayon bath towels. A similar effect is observed with liquid fuels or melted wax and their wicks. Capillary action is thought to be at least partially responsible for transporting water from the roots to the tops of trees, even tall ones. On the other hand, some liquids have stronger cohesive forces than adhesive forces. In this case, in the presence of a capillary, the liquid is forced down from its surface; this is an example of a type of capillary action called capillary depression. In this case, the meniscus curves downward. Mercury has very strong cohesive forces; when a capillary is placed in a pool of mercury, the surface of the mercury liquid is depressed (Figure 10.14 “Capillary Action”). (a) Capillary rise is seen when adhesion is strong, such as with water in a thin glass tube. (b) Capillary depression is seen when cohesive forces are stronger than adhesive forces, such as with mercury and thin glass tubes. Wax is composed of long hydrocarbon molecules that do not interact well with water. (Hydrocarbons are compounds with C and H atoms; for more information on hydrocarbons, see Chapter 16 “Organic Chemistry”.) That is, a thin layer of wax will not be wetted by water. A freshly waxed car has low adhesive forces with water, so water beads up on the surface, as a consequence of its cohesion and surface tension. This minimizes the contact between water and metal, thus minimizing rust. Droplets of water on a freshly waxed car do not wet the car well because of low adhesion between water and the waxed surface. This helps protect the car from rust. 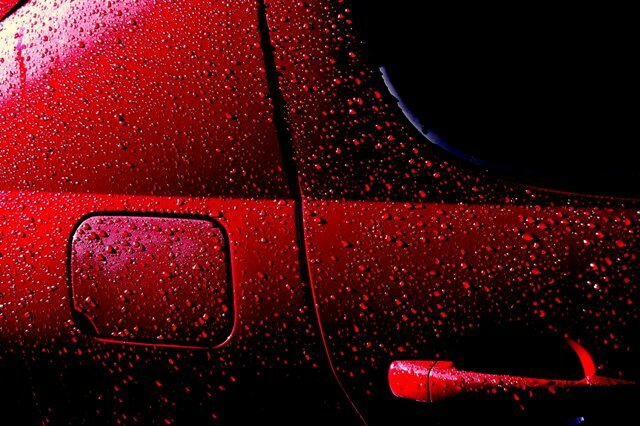 “Wet Red Car 1′′ by Rob Innes is licensed under the Creative Commons Attribution-NonCommercial-NoDerivs 2.0 Generic. If volume is limited, evapouration eventually reaches a dynamic equilibrium, and a constant vapour pressure is maintained. What is the difference between evapouration and boiling? What is the difference between a gas and vapour? Define normal boiling point in terms of vapour pressure. Is the boiling point higher or lower at higher environmental pressures? Explain your answer. Referring to Figure 10.9 “Plots of Vapor Pressure versus Temperature for Several Liquids”, if the pressure is 400 torr, which liquid boils at the lowest temperature? Referring to Figure 10.9 “Plots of Vapor Pressure versus Temperature for Several Liquids”, if the pressure is 100 torr, which liquid boils at the highest temperature? 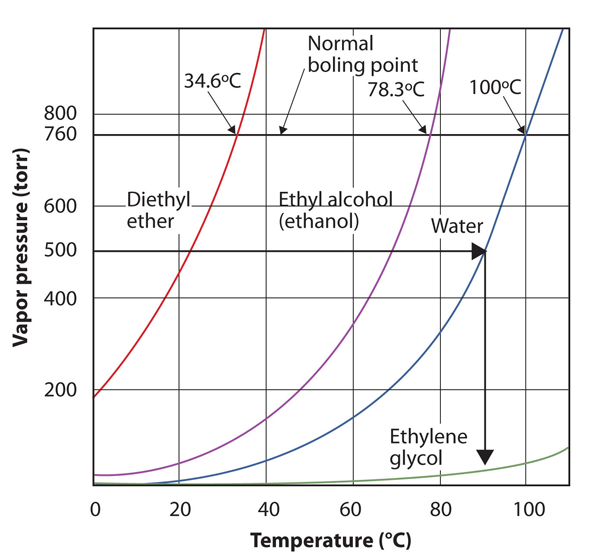 Referring to Figure 10.9 “Plots of Vapor Pressure versus Temperature for Several Liquids”, estimate the boiling point of ethanol at 200 torr. Referring to Figure 10.9 “Plots of Vapor Pressure versus Temperature for Several Liquids”, at approximately what pressure is the boiling point of water 40°C? Explain how surface tension works. From what you know of intermolecular forces, which substance do you think might have a higher surface tension—ethyl alcohol or mercury? Why? Under what conditions would a liquid demonstrate a capillary rise? 12. Under what conditions would a liquid demonstrate a capillary depression? 13. Using the phase diagram from the example question earlier in this section, what state of matter is depicted by point 4? How could you change matter at point 2 to the gas phase? Evapouration occurs when a liquid becomes a gas at temperatures below that liquid’s boiling point, whereas boiling is the conversion of a liquid to a gas at the liquid’s boiling point. Surface tension is an imbalance of attractive forces between liquid molecules at the surface of a liquid. Adhesion must be greater than cohesion. Point 4 represents the supercritical fluid state. Matter at point 2 could be changed to the gas phase by either decreasing the pressure, or increasing the temperature. Properties of Liquids by David W. Ball and Jessie A. Key is licensed under a Creative Commons Attribution-NonCommercial-ShareAlike 4.0 International License, except where otherwise noted.